Dairy farmers in Maharashtra, Telangana, Andhra Pradesh and Tamil Nadu are grappling with a peculiar problem. While the quality and quantity of the milk their cows produce have improved over the years, the price they get is going down. “Till a few years ago, my five cows were yielding just 10 litres of milk a day. I improved the feed and today, they produce 22 litres of high-fat milk,” says H Venkanna Reddy, a small farmer from Telangana’s Jangaon district. This year he is getting Rs 22-25 per litre of milk, which is close to 30 per cent lower than what he got last year. A similar story is narrated by Nilesh Chippde, a farmer in Maharashtra’s Beed district, when he says that while milk procurers are constantly quoting lower prices, cattle feed cost is gradually increasing. “I am struggling to rear my 12 cows now,” he says. Deepak Deshmukh, a milk procurer for Vaishno Devi Food Private Limited in Maharashtra’s Osmanabad district, says even his commission has been lowered from Rs 3 per litre in 2015 to Rs 1 now. “Officers at the plant say the price crash has been triggered by state-backed cooperative Karnataka Milk Federation (KMF), which has flooded the market with products 5-10 per cent cheaper than competing brands,” says Deshmukh, adding that he does not understand how KMF manages to sell its products below the market price. An analysis by Down To Earth shows that KMF has been able to keep the price of its products “artificially low” because successive Karnataka governments have been giving financial support to increase the state dairy cooperative’s procuring capacity over the past decade. Today it is the second highest procurer of milk in the country, after Gujarat’s Amul cooperative. KMF’s transformation, which has brought cheers to dairy farmers in the state, has been possible because of political will. In 2008, B S Yedurappa was elected the chief minister after he promised to increase the milk procurement price by Rs 2 per litre. In just a year, KMF’s milk procurement increased by 17 per cent to 3.5 million kilograms of milk a day (MKPD). By 2010, it reached to 3.7 MKPD. In 2013, a Congress-led government came to power by promising to increase the procurement price by another Rs 2 per litre. In November 2016, it once again increased the price by Rs 1 to help farmers tide over the drought-like conditions that the state had been witnessing since 2014-15. Today, over 80 per cent of the dairy farmers in the state sell directly to KMF. This overdrive has left KMF with surplus milk. Of the 6.4 MKPD the cooperative procures, only 4 MKPD is consumed within the state. The remaining 2.4 MKPD of milk is processed into different products such as ghee and milk powder, and sold in urban markets in over 17 states. While most states have milk cooperatives, bulk of the dairy farmers still sell their produce to private procurers such as Deshmukh or to dairy processing plants. As a result, milk procurement in state-backed cooperatives in Maharashtra, Andhra Pradesh and Tamil Nadu has more or less stagnated in the past decade. For instance, Maharashtra, the second largest milk procurement state till 2010, has added just 0.06 MKPD till 2015. 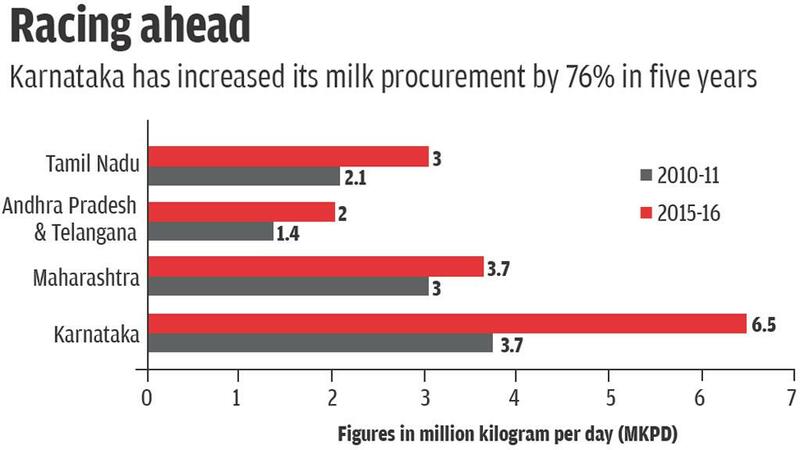 In contrast, the milk procurement of Karnataka has increased by 76 per cent in the past five years (see ‘Racing ahead’). A KMF official, requesting anonymity, says increasing the procurement price by Rs 5 a litre in the past decade has doubled the income of most dairy farmers in the state. He says the average daily income of farmers in the state’s Gadag district has doubled to Rs 750 because of the “nominal hike” in the procurement prices. The state government is spending Rs 1,200 crore a year on the stimulus. It has also introduced a Rs 750-crore scheme, Ksheera Bhagya, to provide 150 millilitres of milk daily to its 12 million schoolchildren under the mid-day meal scheme, which has increased the state’s milk demand. These measures are benefitting 2.5 million dairy farmers in Karnataka. Despite turning the fortunes of the state’s dairy farmers, experts believe the stimulus is hurting farmers in other states and is untenable in the long run. The Karnataka model of increasing milk production without a market demand is hurting the industry. The state is effectively reducing the price of dairy products, and then compensating farmers. “KMF’s dairy products sold under the brand Nandini are much cheaper than other brands. For example, its ghee is Rs 50 cheaper than comparable brands. Even its milk powder is cheaper by Rs 10-15 a kg,” says Deshmukh. Still, a dairy farmer in Karnataka gets Rs 27-35 for a litre of milk, close to Rs 10 more than what a dairy farmer in Maharashtra earns. R S Sodhi, managing director, Amul, says the Karnataka model is only helping consumers and not farmers. “Our rough assessment shows that dairy farmers across the country are losing Rs 30,000 crore a year because of the Karnataka subsidy,” says Sodhi. Even Amul is losing more than Rs 300 crore per year to keep its product prices comparable to those sold by Nandini. For example, the price of toned milk in most metro cities is around Rs 42, but it dipped to Rs 35 in Bengaluru because of competition. “Dairy companies shift this burden on farmers by reducing the procurement price,” says Sodhi. Sagari R Ramdas, a veterinarian with non-profit Anthra, says the current crisis is a problem of plenty. “What Karnataka is doing is just a replica of the global practice where emphasis has been made to increase production without acknowledging the market requirements,” says Ramdas, who is also part of the Food and Sovereignty Alliance, a non-profit working on with issues faced by small farmers. As a result, the focus has been on maximising profits instead of linking production to a planned market. “Farmers are being trapped in this cycle of producing more and more,” says Ramdas. She adds that instead of the indirect stimulus, states should invest the money in creating market linkages and infrastructure. Dairy farmers are currently being forced to sell their milk to the nearest market because the product is perishable. Access to other markets will automatically ensure them fair price. Sodhi adds that it would be better to provide direct subsidy to farmers, and build infrastructure in rural areas, instead of disrupting the market. (This story was first published in the 16-28th Februray issue of Down To Earth). What is pushing India's small dairy farmers out of business?